Are You Exposed to Radon in Your Home or Workplace? Lung cancer kills thousands of Americans every year. Smoking, radon, and secondhand smoke are the leading causes of lung cancer. Although lung cancer can be treated, the survival rate is one of the lowest for those with cancer. From the time of diagnosis, between 11 and 15 percent of those afflicted will live beyond five years, depending upon demographic factors. In many cases lung cancer can be prevented. Smoking is the leading cause of lung cancer. Smoking causes an estimated 160,000* cancer deaths in the U.S. every year (American Cancer Society, 2004). And the rate among women is rising. On January 11, 1964, Dr. Luther L. Terry, then U.S. Surgeon General, issued the first warning on the link between smoking and lung cancer. Lung cancer now surpasses breast cancer as the number one cause of death among women. A smoker who is also exposed to radon has a much higher risk of lung cancer. Radon is the number one cause of lung cancer among non-smokers, according to EPA estimates. Overall, radon is the second leading cause of lung cancer. Radon is responsible for about 21,000 lung cancer deaths every year. About 2,900 of these deaths occur among people who have never smoked. On January 13, 2005, Dr. Richard H. Carmona, the U.S. Surgeon General, issued a national health advisory on radon. Read a study by Dr. William Field on radon-related lung cancer in women at www.cheec.uiowa.edu/misc/radon.html. Secondhand smoke is the third leading cause of lung cancer and responsible for an estimated 3,000 lung cancer deaths every year. Smoking affects non-smokers by exposing them to secondhand smoke. Exposure to secondhand smoke can have serious consequences for children's health, including asthma attacks, affecting the respiratory tract (bronchitis, pneumonia), and may cause ear infections. EPA.gov. Radon (Rn) Health Risks. Radon is a radioactive gas that is known to cause cancers. Radon causes about 21,000 lung cancer deaths each year in the U.S.
Radon is produced from the natural breakdown of uranium in soil, rock and water. Radon is found all over the U.S. It can be detected in any type of building - homes, offices, and schools. It is impossible to smell or taste radon. Radon enters a home through cracks and other holes in the foundation. It builds up inside buildings. Nearly 1 out of every 15 homes in the U.S. is estimated to have elevated radon levels. Testing for radon is easy. Both short-term and long-terms testing devices are available. It is possible to reduce radon levels in the home if they are found to be elevated. Test your home for radon - it's easy and inexpensive. Fix your home if your radon level is 4 picocuries per liter, or pCi/L, or higher. Radon comes from the natural (radioactive) breakdown of uranium in soil, rock and water and gets into the air you breathe. Radon can be found all over the U.S. It can get into any type of building - homes, offices, and schools - and result in a high indoor radon level. But you and your family are most likely to get your greatest exposure at home, where you spend most of your time. You should test for radon. Testing is inexpensive and easy - it should only take a few minutes of your time. Millions of Americans have already tested their homes for radon (see How to Test Your Home). Radon-resistant construction techniques can be effective in preventing radon entry. When installed properly and completely, these simple and inexpensive techniques can help reduce indoor radon levels in homes. In addition, installing them at the time of construction makes it easier and less expensive to reduce radon levels further if these passive techniques don't reduce radon levels to below 4 pCi/L. Every new home should be tested after occupancy, even if it was built radon-resistant. If radon levels are still in excess of 4 pCi/L, the passive system should be activated by having a qualified mitigator install a vent fan. For more explanation of radon resistant construction techniques, refer to EPA publication, Building Radon Out: A Step-by-Step Guide on How to Build Radon-Resistant Homes (PDF) (84 pp., 5.5 M). Radon from soil gas is the main cause of radon problems. Sometimes radon enters the home through well water (see "Radon in Water" below). In a small number of homes, the building materials can give off radon, too. However, building materials rarely cause radon problems by themselves. Radon can also be a problem in schools and workplaces. Ask your state radon office about radon problems in schools, daycare and childcare facilities, and workplaces in your area. You can't see radon, but it's not hard to find out if you have a radon problem in your home. All you need to do is test for radon. Testing is easy and should only take a few minutes of your time. The amount of radon in the air is measured in "picocuries per liter of air," or "pCi/L." There are many kinds of low-cost "do-it-yourself" radon test kits you can get through the mail and in some hardware stores and other retail outlets. If you prefer, or if you are buying or selling a home, you can hire a qualified tester to do the testing for you. You should first contact your state radon office about obtaining a list of qualified testers. You can also contact a private radon proficiency program for lists of privately certified radon professionals serving your area. There are Two General Ways to Test for Radon: Testing is easy and should only take a few minutes of your time. The quickest way to test is with short-term tests. Short-term tests remain in your home for two days to 90 days, depending on the device. "Charcoal canisters," "alpha track," "electretion chamber," "continuous monitors," and "charcoal liquid scintillation" detectors are most commonly used for short-term testing. Because radon levels tend to vary from day to day and season to season, a short-term test is less likely than a long-term test to tell you your year-round average radon level. If you need results quickly, however, a short-term test followed by a second short-term test may be used to decide whether to fix your home (see Home Sales). The higher your initial short-term test result, the more certain you can be that you should take a short-term rather than a long-term follow up test. If your first short-term test result is more than twice EPA's 4 pCi/L action level, you should take a second short-term test immediately. Follow the instructions that come with your test kit. If you are doing a short-term test, close your windows and outside doors and keep them closed as much as possible during the test. Heating and air-conditioning system fans that re-circulate air may be operated. Do not operate fans or other machines which bring in air from outside. Fans that are part of a radon-reduction system or small exhaust fans operating only for short periods of time may run during the test. If you are doing a short-term test lasting just 2 or 3 days, be sure to close your windows and outside doors at least 12 hours before beginning the test, too. You should not conduct short-term tests lasting just 2 or 3 days during unusually severe storms or periods of unusually high winds. The test kit should be placed in the lowest lived-in level of the home (for example, the basement if it is frequently used, otherwise the first floor). It should be put in a room that is used regularly (like a living room, playroom, den or bedroom) but not your kitchen or bathroom. Place the kit at least 20 inches above the floor in a location where it won't be disturbed - away from drafts, high heat, high humidity, and exterior walls. Leave the kit in place for as long as the package says. Once you've finished the test, reseal the package and send it to the lab specified on the package right away for analysis. You should receive your test results within a few weeks. Test your home now and save your results. If you find high radon levels, fix your home before you decide to sell it. Sometimes short-term tests are less definitive about whether or not your home is above 4 pCi/L. This can happen when your results are close to 4 pCi/L. For example, if the average of your two short-term test results is 4.1 pCi/L, there is about a 50% chance that your year-round average is somewhat below 4 pCi/L. However, EPA believes that any radon exposure carries some risk - no level of radon is safe. Even radon levels below 4 pCi/L pose some risk, and you can reduce your risk of lung cancer by lowering your radon level. If your living patterns change and you begin occupying a lower level of your home (such as a basement) you should retest your home on that level. Even if your test result is below 4 pCi/L, you may want to test again sometime in the future. More and more, home buyers and renters are asking about radon levels before they buy or rent a home. Because real estate sales happen quickly, there is often little time to deal with radon and other issues. The best thing to do is to test for radon NOW and save the results in case the buyer is interested in them. Fix a problem if it exists so it won't complicate your home sale. If you are planning to move, read EPA's pamphlet "Home Buyer's and Seller's Guide to Radon," which addresses some common questions (see also Radon in Real Estate). You can also use the results of two short-term tests done side-by-side (four inches apart) to decide whether to fix your home. Buyers often ask if a home has been tested, and if elevated levels were reduced. Buyers frequently want tests made by someone who is not involved in the home sale. Your state radon office can assist you in identifying a qualified tester. Buyers might want to know the radon levels in areas of the home (like a basement they plan to finish) that the seller might not otherwise test. 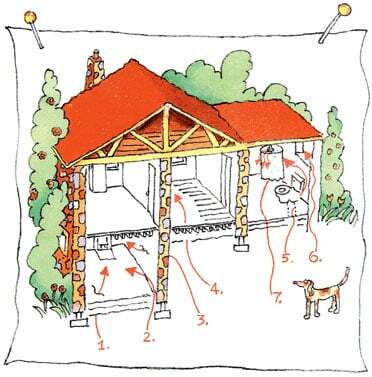 Today many homes are built to prevent radon from coming in. Building codes in your state or local area may require these radon-resistant construction features. If you are buying or renting a new home, ask the owner or builder if it has radon-resistant features. The EPA recommends building new homes with radon-resistant features in high radon potential (Zone 1) areas. Even if built radon-resistant, every new home should be tested for radon after occupancy. If you have a test result of 4 pCi/L or more, consult a qualified mitigator to estimate the cost of upgrading to an active system by adding a vent fan to reduce the radon level. In an existing home, the cost to install a radon mitigation system is about the same as for other common home repairs. For more information, refer to EPA's Map of Radon Zones and other useful EPA documents on radon-resistant new construction (see publications). See also EPA's Indoor airPLUS new homes certification program. There are two main sources for the radon in your home's indoor air, the soil and the water supply. Compared to radon entering the home through water, radon entering your home through the soil is usually a much larger risk. Radon in your home's water is not usually a problem when its source is surface water. A radon in water problem is more likely when its source is ground water, e.g. a private well or a public water supply system that uses ground water. If you are concerned that radon may be entering your home through the water and your water comes from a public water supply, contact your water supplier. If you've tested the air in your home and found a radon problem, and your water comes from a well, have your water tested. If you've tested your private well and have a radon in water problem, it can be fixed. Your home's water supply can be treated in two ways. Point-of-entry treatment can effectively remove radon from the water before it enters your home. Point-of-use treatment devices remove radon from your water at the tap, but only treat a small portion of the water you use and are not effective in reducing the risk from breathing radon released into the air from all water used in the home. For more information, call EPA's Drinking Water Hotline at (800) 426-4791 or visit www.epa.gov/safewater/radon.html If your water comes from a private well, you can also contact your state radon office. Since there is no known safe level of radon, there can always be some risk. But the risk can be reduced by lowering the radon level in your home. There are several proven methods to reduce radon in your home, but the one primarily used is a vent pipe system and fan, which pulls radon from beneath the house and vents it to the outside. This system, known as a soil suction radon reduction system, does not require major changes to your home. Sealing foundation cracks and other openings makes this kind of system more effective and cost-efficient. Similar systems can also be installed in houses with crawl spaces. Radon contractors can use other methods that may also work in your home. The right system depends on the design of your home and other factors. Ways to reduce radon in your home are discussed in EPA's "Consumer's Guide to Radon Reduction." You can also download a copy from our radon publications page. The cost of reducing radon in your home depends on how your home was built and the extent of the radon problem. Most homes can be fixed for about the same cost as other common home repairs. The cost to fix can vary widely; consult with your state radon office or get one or more estimates from qualified mitigators. The cost is much less if a passive system was installed during construction. Lowering high radon levels requires technical knowledge and special skills. You should use a contractor who is trained to fix radon problems. A qualified contractor can study the radon problem in your home and help you pick the right treatment method. Check with your state radon office for names of qualified or state certified radon contractors in your area. You can also contact private radon proficiency programs for lists of privately certified radon professionals in your area. For more information on private radon proficiency programs, visit www.epa.gov/radon/radontest.html. Picking someone to fix your radon problem is much like choosing a contractor for other home repairs - you may want to get references and more than one estimate. If you are considering fixing your home's radon problem yourself, you should first contact your state radon office for guidance and assistance (see www.epa.gov/radon/whereyoulive.html). Most homes can be fixed for about the same cost as other common home repairs. You should also test your home again after it is fixed to be sure that radon levels have been reduced. Most soil suction radon reduction systems include a monitor that will indicate whether the system is operating properly. In addition, it's a good idea to retest your home every two years to be sure radon levels remain low. If you are planning any major structural renovation, such as converting an unfinished basement area into living space, it is especially important to test the area for radon before you begin the renovation. If your test results indicate a radon problem, radon-resistant techniques can be inexpensively included as part of the renovation. Because major renovations can change the level of radon in any home, always test again after work is completed. To estimate your risk of radon exposure if you smoke or have never smoked, please see the Radon Risk Table. * If the radon test is part of a real estate transaction, the result of two short-term tests can be used in deciding whether to mitigate. 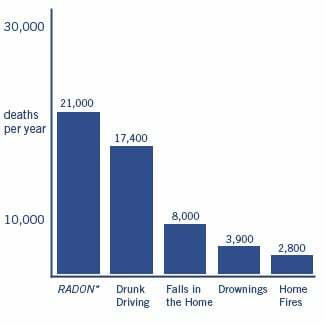 For more information, see EPA's "Home Buyer's and Seller's Guide to Radon". wwwww.epa.gov/radon EPA's main radon page. Includes links to publications, Hotlines, private radon proficiency programs and more. If you need further information about radon or would like to ask a question, see our Frequently Asked Questions system at http://iaq.supportportal.com and select the topic area radon. You can use this interface to submit questions and subscribe to specific topic information. National Radon Hotline Purchase radon test kits by phone. National Radon Helpline Get live help for your radon questions. National Radon Fix-It Line For general information on fixing or reducing the radon level in your home. Safe Drinking Water Hotline, operated under contract to EPA. 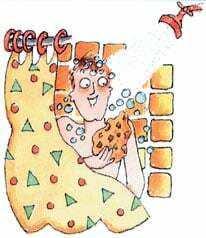 For information on testing, treatment, radon in water, and drinking water standards. Call your state office for additional help with any of your radon questions. Up-to-date information on how to contact your state radon office, your EPA Regional Offices and Tribal Coordinators is available at www.epa.gov/radon/whereyoulive.html (just click on your state or EPA regional office). Visit www.epa.gov/iaqtribal for information specifically presented for Tribal Partners. Though it's difficult to say why some people develop cancer while others don't, research shows that certain risk factors increase a person's odds of developing cancer. These risk factors include growing older, family history of cancer, diet, alcohol and tobacco use, and exposure to sunlight, ionizing radiation, certain chemicals, and some viruses and bacteria. Certain behavioral, lifestyle, and environmental factors contribute to cancer. Cancer prevention involves modifying these factors to decrease cancer risk. Tobacco use, alcohol consumption, physical inactivity, inadequate fruit and vegetable intake, and obesity increase the risk of certain cancers. Vaccines, genetic testing, and cancer screening also play a role in cancer prevention. Early warning signs of job stress include headache, sleep disturbance, difficulty in concentrating, short temper, upset stomach, job dissatisfaction, and low morale. Stress on the job can be damaging to your health in that job stress is the outcome when job demands cannot be met. Lung cancer kills more men and women than any other form of cancer. Eight out of 10 lung cancers are due to tobacco smoke. Lung cancers are classified as either small cell or non-small cell cancers. The lungs are primarily responsible for the exchange of oxygen and carbon dioxide between the air we breathe and the blood. Eliminating carbon dioxide from the blood is important, because as it builds up in the blood, headaches, drowsiness, coma, and eventually death may occur. The air we breathe in (inhalation) is warmed, humidified, and cleaned by the nose and the lungs. Treatment options are dependent on the type of pulmonary fibrosis; lung transplant and/or medications are options. Secondhand smoke can cause illness and disease in nonsmokers. Some of these conditions include lung cancer, heart disease, respiratory illnesses such as asthma, SIDS, bronchitis, and pneumonia. Learn how you can protect yourself and your family from secondhand smoke exposure in the home environment and workplace. Multiple chemical sensitivity (MCS) or also referred to as sick building syndrome or environmental illness is the name given by some to a condition in which various symptoms reportedly appear after a person has been exposed to any of a wide range of chemicals. The exposure may occur as a major event, such as a chemical spill, or from long-term contact with low-levels of chemicals, such as in an office with poor ventilation. 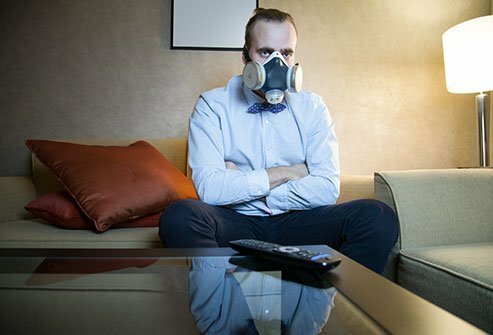 As a result of exposure, people with MCS (Si ck Building Syndrome) develop sensitivity and have reactions to the chemicals even at levels most people can tolerate. Smoker's lung photo essay is a collection of pictures and microscopic slides of lung disease caused by cigarette smoking. Smoker's lung refers to the diseases and structural abnormalities in the lung caused by cigarette smoking. Though the cause of stomach cancer is unknown, risk factors for stomach cancer include diet, H. pylori infection, smoking age, gastritis, stomach surgery, family history, and pernicious anemia. Symptoms include stomach discomfort, feeling full after a small meal, nausea and vomiting, and weight loss. Treatment depends upon staging and may involve surgery, radiation therapy, or chemotherapy.